So here's something everyone should remember from the 90s: beanie babies. These small furry animals stuffed with beads blew up like Hiroshima in the early 90s. And it wasn't about having a few lovable playmates, it was about having as many of these bean-filled buddies as you could possibly have. One of my most notable memories is the controversy surrounding the TY tag on the beanie babies. I personally found the tag to be somewhat of an annoyance so naturally I ripped off the tags of my beanie babies the minute I got them. 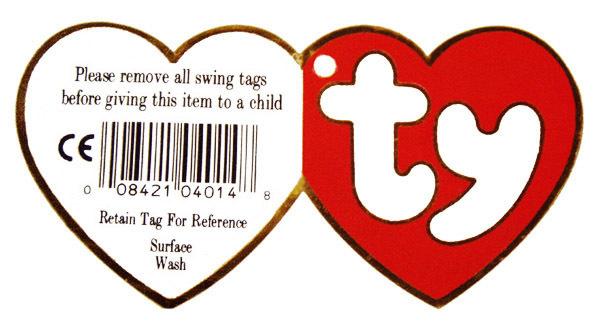 However, it soon became quite a big deal to keep the TY tag on your beanie babies. People said this was because the tag meant the beanie baby had value. Looking back I'd like to ask these people, WHAT VALUE?! I mean the originals were what $5? And it's not like the toys were some rare specimen. Every kid had at least ten. Did people really believe that if they preserved the beanie babies tag they would be able to sell it back years later for a huge profit? Come on. Though I was strongly opposed to keeping the TY tags on, I was challenged at school by some fourth grade brat: "That's not a REAL beanie baby! It doesn't have a TY tag." "Yes it is, I just took it off," I retorted. "Yeah, right! Everyone knows to keep the tag on. That's totally fake!" That was it. From this point on I found it essential to keep the TY tags on. The tag was essentially a status symbol. If your TY tag was on you were flying first class. If your TY tag was ripped off--you were in coach, and your parents cheap-ed out of getting you the good one. "I just got the just released, limited edition, brand-new, beanie baby Princess Diana bear. So now I have 862 beanie babies! Ha!!" "Oh yeah?! 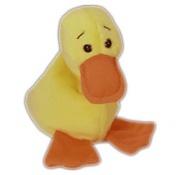 Well, I have 904 beanie babies and my Mom said she ordered the Diana bear plus the new Quacker the Duck without the wings and they only made like 15 Quacker the Ducks in the world!" Thanks to YOU I kept 110 beanie babies stored in my closet until I graduated high school. Jerks. I remember beanie babies. Like you the tag did annoy me, but I kept them on because it seem more authentic. 110! Wow! I only had a couple, but I wasn't really into them any way. I don't have them any more either. If you count the little mini ty beanie babies that you could get with a happy meal at McDonalds, I had around 250. I was obsessed. I loved them. I played with them everyday. I collected them because I had nothing else to do. I was home schooled in elementary school so I only had like three friends and I guess my mom thought that 250 bean filled animals would fill the void. lol. I loved them. Holy moley Beanie Babies were a HUGE part of my adolescence. Yep, I absolutely remember feeling conflicted about whether to sever the ty tag so I could fully enjoy my little creature without plastic in my face, or to preserve the tag in case I ever decided to sell out my stuffed friends for some quick cash (which I never did!). And I remember the Princess Diana bear. I was (still am, kind of) completely obsessed with Princess Di, naturally, immortalizing her in Beanie Baby form was right up my alley. Yeah, there was a bit of competition on the playground around Beanie Babies. Crazy how these innocent little creatures united us with cute poems and fun names, but also separated us because they were such a commodity! I'll man up and say that my sister and I put together a ridiculous collection of beanie babies, the whole time assuming that we were just assuring our future wealth. Well that wealth is now in a huge tupperware box in our attic, packed to the brim with useless felt bags of beans. But oh man was it fun to collect them. 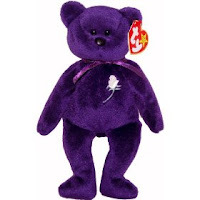 I remember being a little kid and saving up my money to go to beanie baby shows and spending like $40 on a rarer-item. Sigh. A lifetime of bad choices certainly started from that point. It's very comforting to see that other people were addicted to these things too. Can't wait for the Pokemon post. I'm still holding on to mine. I bet in Years to come they will be of value again.